WASHINGTON DC - Forerunner is approached by an unknown assailant, who explains that the Monitors used her, regarded her and her people as animals. He thinks different, as he does regarding the Monitors' belief in their omniscience. Forerunner denies what this person is telling her. The man calls himself The Monarch, and he offers her a chance at redemption, as well as the opportunity to be her own master. Forerunner agrees to follow him but promises to kill him if he breaks his word. METROPOLIS - In Suicide Slum, Jimmy Olsen deliberately picks a fight with a local gang to try and trigger his new powers, but is given a right cross and falls back into trash. But when the gang tries to finish the job, spines expel from Jimmy's skin and drives them off. Elsewhere, Holly Robinson is approached by a statuesque woman in Ancient Greek attire, calling herself a "concerned sister". She brings Holly to what she calls a woman's shelter, but in fact looks like an Amazonian sanctuary. KEYSTONE CITY - The Pied Piper and The Trickster evade the police, who are after them for their role in the murder of The Flash. Both are in panic; while neither dealt the killing blow to the Fastest Man Alive, they were with the other rogues and assume that heroes will think otherwise. Trickster rejects the idea of going to the JLA for fear of getting mindwiped by Zatanna or shot by Green Arrow, or worse... Batman. Trickster convinces Piper that the only course of action is to lay low until it blows over. As they walk away in agreement, voices in the shadows debate whether to attack the pair now. THE ROCK OF ETERNITY - Marvel continues to explain that Mary's brutality in her battle with the demon Pharyngula left him concerned, and adds that black is a new look for his sister. Mary explains that she woke up from a coma powerless and alone and couldn't just "start her life over" as Billy suggested. Black Adam shared his power with her because she asked him to, and Marvel is shocked that she'd take such a risk. Marvel suggests that maybe it was his sister's destiny to lose her powers. Mary, in denial, retorts that she has the power again to do good, and she intends to do so whether Billy wants to be part of her destiny or not, and flies through the Rock. The Monitors continue their recount of the Multiverse's story, now focusing on The Crisis, beginning with how antimatter energy that eradicated whatever it touched from existence forced Earth-3's Lex and Lois Luthor to send their child, Alexander to Earth-1. The Monitor observing The Crisis encountered the child, as well as did what he could to stop the annihilation, even gathering a team of Earth-1's heroes, but it was for naught. While the team time travelled to carry out their overall mission, the Monitor in question was killed. Such events were the results of the actions of the Anti-Monitor. Alexander Luthor grew to adulthood overnight and played a key role in the defeat of the Anti-Monitor, as well as the sacrifices of Earth-1's Supergirl and the Barry Allen Flash. Darkseid focused a near lethal strike through Alexander to disable the Anti-Monitor while one universe after another ceased to exist. Earth-2's Superman dealt the final blow, but was now without a home, as well as his wife, Lois, Alexander, and Earth-Prime's Superboy. They left together to watch the new universe grow, the pieces of Earths 1 and 2 merging together without any knowledge of what had existed before. Though peace had been established, the seeds of destruction had been sown, as the Monitor remarked. Main Story - 3: I'd just like to point out the poor timing of these books in conjunction with other titles, in particular the death of the Flash. I collect the Bart Allen Flash stories and I'm unsure as to what the heck happened. This issue ruined it pretty much for me in regards to the Piper-Trickster story. However, the book makes up for it with the appearance of The Monarch. He carries an existentialist approach to life that he's trying to impart on Forerunner, who indeed has much potential with her abilities and her character. He's trying to encourage her to take control of her life, to be her own woman; his intentions seem altruistic, but like everything in the DC-verse nothing is what it seems, especially if he has connections to the Monitor race. It seems as though Dini is taking a break from the Donna-Jason subplot. As for the Jimmy story, it keeps getting weirder and weirder; there's no rational explanation why he is manifesting different abilities. It seems as though the ability depends on the situation and the level of urgency, similar to that old Marvel Comics villain The Answer. The only saving grace in this issue is the Mary Marvel-Captain Marvel reunion. It best signifies a family reunion gone bad by way of an old fashioned brother-sister squabble on a superhuman level. Is Billy right? Is Mary fighting destiny rather than embracing it? I find it runs counter to the Monarch-Forerunner storyline; where earlier you see a complete stranger take a lost and lonely woman under his wing to give her purpose again, we find an established hero reject his own sister for fear of upsetting the delicate magical balance. We could be seeing the beginning of a new female Black Marvel rather than Mary Marvel with Black Adam's powers (still waiting on an explanation on how he acquired them again), which could be and interesting dynamic since Freddy's now becoming the new Shazam. All in all, the book holds the reader's interest but I feel that the writing team missed its mark on this one just slightly. It seemed a little bit like a soap opera episode; too many subplots disjointed and breaks in-between. Main Art - 5: Aside from the Mary-Billy storyline, the art is the second redeeming factor in this issue. The splash page of Mary in the Rock of Eternity was brilliantly laid out. Magmo captured the "little girl lost" look behind the awesome power of femme fatales like Mary Marvel and Forerunner. The design of Jimmy Olsen, however, left a lot to be desired, as well as the gang that attacked him. They just seemed a little too weird; I can't really describe it. The Monarch's design is awesome; his appearance carries with it an inborn influx of majesty, nobility, and power. If Magmo is behind it, more power to him. If not then that's cool because he handled it very well. Great job. Back-up Story - 5: Again, Jurgens. What can you say? The Reader's Digest of the DC Multiverse focuses on the main points and has finally reached CRISIS ON INFINITE EARTHS. However I feel he's omitting other details as to not repeat the history of the DC universe segment in 52. Nonetheless it's beautifully scripted so far. Back-up Art - 5: Jurgens. Nuff said. 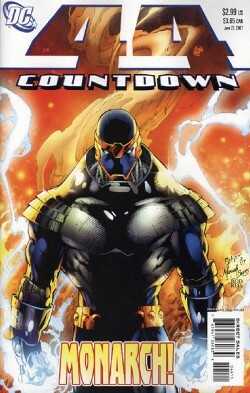 Cover Art - 5: Ed Benes and Mariah Benes outdid themselves in their rendition of the Monarch. The flames and smoke in the background give off a hint that this is not an adversary to be taken lightly, and also leaves you wondering if it is a hero or a villain. The mask is emotionless; that stern look conveys to the viewer that this individual is going to be a major player in the game. Time will tell if intuition proves to be correct.